PanARMENIAN.Net - Poland's conservative government says anyone who uses language that implies Polish responsibility for Nazi German atrocities will face jail or a fine, BBC News reports. The government has agreed on a new law to criminalise "insulting and slandering the good name of Poland". The ruling Law and Justice Party (PiS) has a clear majority in parliament. 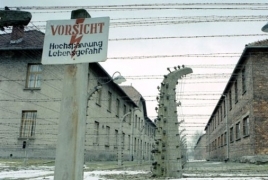 Phrases like "Polish concentration camps" will be punishable by up to three years in jail. Millions died in Nazi German camps on Polish soil. Under the new law it will be illegal to suggest "publicly and contrary to the facts" that Poles participated in, or bore any responsibility for, the crimes of the Third Reich, a Polish Justice Ministry statement said (in Polish). Millions of people, mostly Jews, from across Europe were killed in six German-run extermination camps in occupied Poland. Further Holocaust atrocities were committed in Nazi concentration camps and ghettos in Poland. The country was occupied by the Nazis between 1939 and 1945. The murders wiped out 90% of Poland's pre-war Jewish population.